Our Dead Sea Mud Facial Mask is a mask that we formulated to compliment our facial line. Formulated with Dead Sea Black Mud to draw toxins from the skin and make your face feel smooth and look radiant in today&apos;s challenging environment. We packed in some really great ingredients such as: dead sea black mud, aloe vera gel, organic eucalyptus essential oil and natural vitamin E. Facial masks are an important part of your facial regime. All of our “Fåcial Products” contain pure therapeutic grade essential oils (some are organic). We use all organic base oils and most of the other ingredients are organic based. We are proud of our “Fåcial Line” as we use ingredients such as: hyaluronic acid, jojoba oil, borage seed oil, evening primrose oil, aloe vera, red rooibos tea, DMAE, MSM, blue green algae extract and many more wonderful ingredients. We package our facial products in either PET bottles or glass bottles with labels attached. The facial masks are packaged in glass jars and placed into a recycled chipboard box with label attached. As discussed earlier under our “Spa Salts”, we have made a decision to drop our Dead Sea Salts due to the sustainability of the Dead Sea, however the Dead Sea Black Mud does not present a problem. 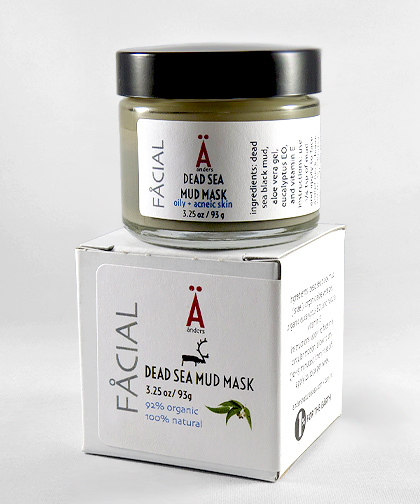 The Dead Sea Mud is extremely effective as a skin-detoxing ingredient. It draws toxins from the skin and leaves your face feeling smooth, refreshed and clean. Skin loving juice and gel extracted from the Aloe Vera plant, naturally moisturizes and soothes the skin. Backing up centuries old beliefs of its reparative and soothing powers, researchers at a major university in Spain reported that Aloe Vera flowers and leaf extracts had antioxidant properties. A team of plastic surgeons compared Aloe Vera gel to 1% silver sulphadiazine cream (common burn treatment) for the treatment of second degree burn wounds and found that Aloe Vera gel showed advantage compared to those dressed with SSD regarding pain relief and healing. Aloe Vera is just a great overall skin products ingredient. This oil is extracted through steam distillation of the leaves and branches of the Eucalyptus tree. Fragrant and fresh, this oil has naturally deodorant and expectorant properties. Eucalyptus is a scent that reminds us of renewal and new life to our senses. Tocopherol is the organic chemical compound of vitamin E and is an antioxidant and cellular renewal ingredient.